The Veranda Room (our most popular room) has exclusive access to the Forty foot Second floor Veranda, where you can enjoy the double swing, and table and chairs while watching the buggies go by. The bed is a "Jenny Lund" Canopy Bed" and the room has a six and a half foot Copper Bath (soaking)Tub in its private bath; and is complete with bubble bath and candles. 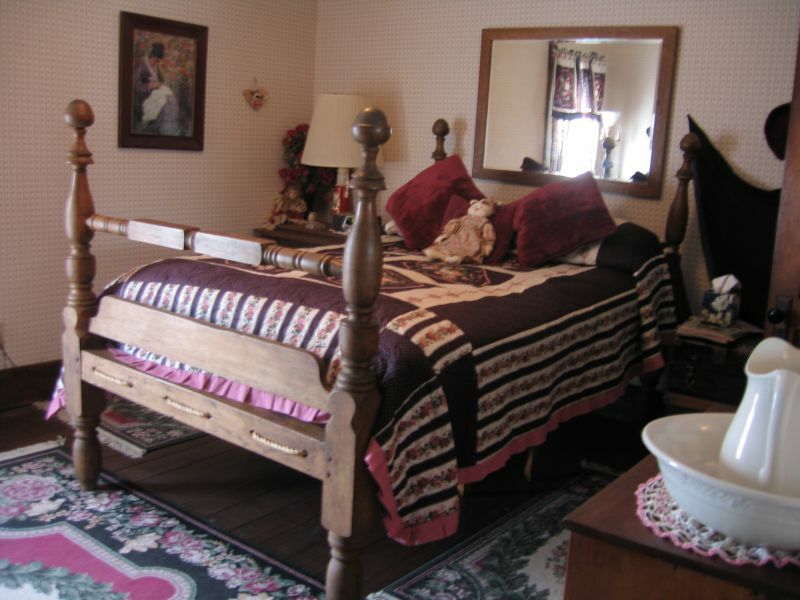 There is also a comfortable antique arm chair, fan, clock radio w/ CD Player, and extra pillows and blanket. Ironing board and Iron available on request. 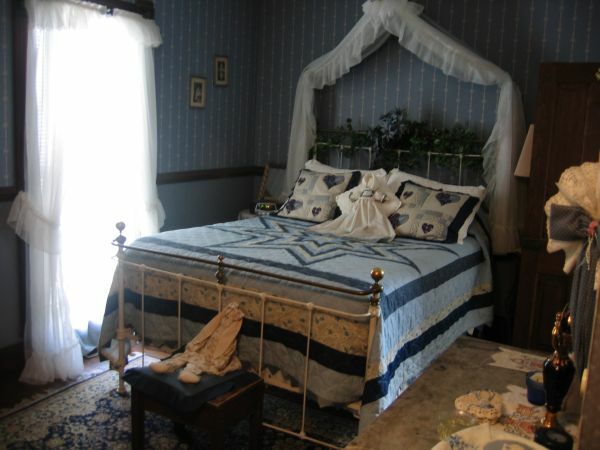 The Blue Room has a "Wrought Iron and Brass Bed" and a shower in its Private Bath, Air-Conditioning, extra pillow, and Quilt, rocking chair, clock radio w/CD player. Ironing board and Iron available on request. We offer, our guests only, a Clydesdale drawn, Sunset Carriage Rde through the Amish Country side. We leave about 30 minutes before Sunset (time varies as sunset time changes)and the ride lasts about 1 1/2 to 2 hours depending on how ambitious or Clydesdale (Clyde) is, and how long we watch the sunset Our Vis-a-Vis style carriage has three guest bench seats and is large enough for every one to ride, As the seasons pass, we have Fur Coats for the Ladies, and Cozy Thermal Lap Blankets, for all. Kitchen privalages, with refrigerator,(with complementary sodas and bottled waters) microwave and stove/oven, Barbeque grill (on the patio) in the flower garden, Champaign Bucket, Ice, and glasses, dishes and silverware. In the Parlor, a Baby Grand Piano, TV, VCR, DVD and Satelite TV (with ALL Premium stations), NetFlix, comfortable seating and parlor games. The Library has a 1919 Player Piano with many rolls, and about 300 antique books., puzzles and games. Gift Certificates: Available on the web or by Phone for any room, ride, or amount.